I routinely comb the a Internet for new strap suppliers and I have discovered that certain styles are very easy to find. For example, leather NATOs and pass-throughs are plentiful, as are straight cut, two-piece straps. You can also find a dizzying variety of heavy Panerai-style leather straps. On this particular browsing trip, I was on the hunt for something more elusive: a thin, simple, tapered strap made from a quality leather, at a bargain price. That last criteria was proving to be the most elusive. That is when I discovered Mitch Boudreaux's Vieux Halloo. 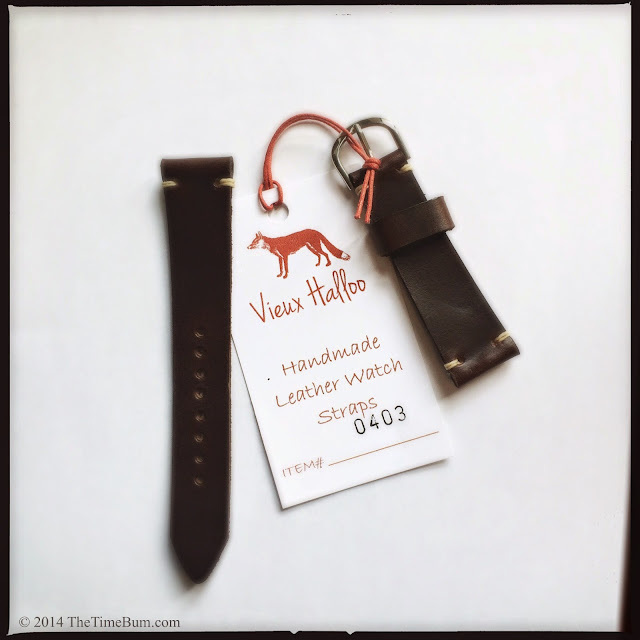 Mitch sent me a new Vieux Halloo strap for review. 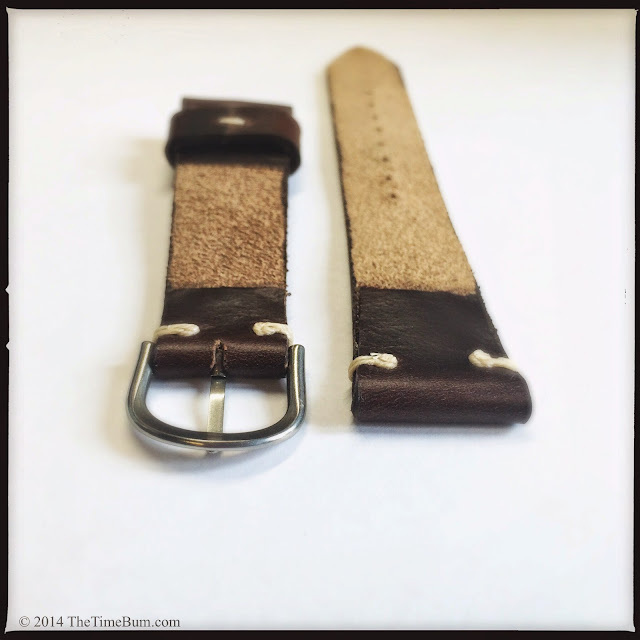 * The strap is Dark Brown Horween Chromexcel, 20 mm at the lug end and tapered to a 16 mm stainless steel buckle. It is a standard length, 68/120 mm or 7.4 inches. The leather is 2.28 mm thick with minimal stitching, in a natural, waxed linen thread. The edges are lightly burnished. The polished pin buckle has a rounded frame for a traditional, almost vintage look. It is mounted with a conventional spring bar so you can easily swap your own. As I have come to expect from Horween leather, the strap is strong and supple with wonderful character. It exhibits a pull-up effect when bent, getting lighter as the oils are pressed away from the stressed area. The strap is well made, and I was particularly pleased to see that the folded area at the lugs had been skived down thin before they were secured. This eliminates additional bulk and lesses the chance of an outline of the flap developing on the upper surface. Since I had a skinny strap, I chose to fit is on a skinny watch. A wafer-thin Rossling & Co. quartz fit the bill. Sure enough, the two paired nicely and disappeared even under my tightest shirt cuff. I would not put the Vieux Halloo on a thick tool watch or diver, but I found it was well suited to a range of modestly sized dress, field, and flight watches. Of course, if you need heavier leather, just ask. Mitch maintains a stock of straps in popular sizes and leathers, but is perfectly willing to make you a custom piece as well. Several different leathers and thread options are offered, of varying color and weight. He initially used remnant Horween leather to keep prices down. While he still has a healthy stock of remnants, he has started to purchase specific pre cut pieces from online suppliers. This may increase prices in time, but should still keep them competitive. 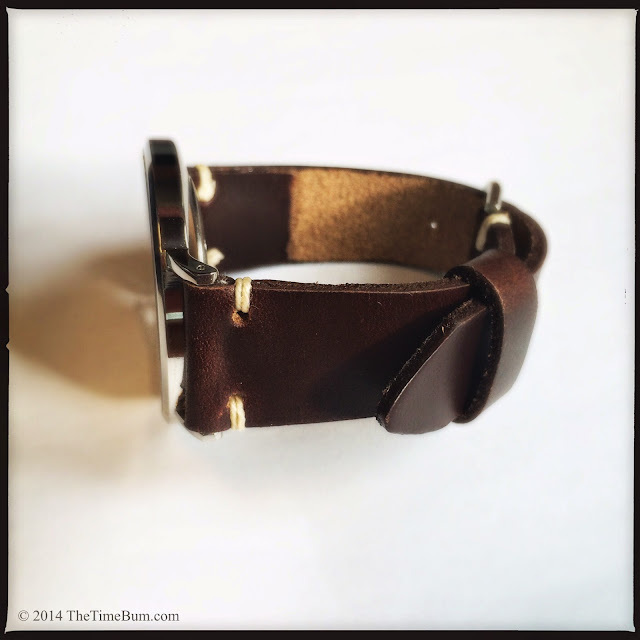 Currently, all of his straps are priced between $40-50, and for a custom Horween strap, I'd call this a steal. 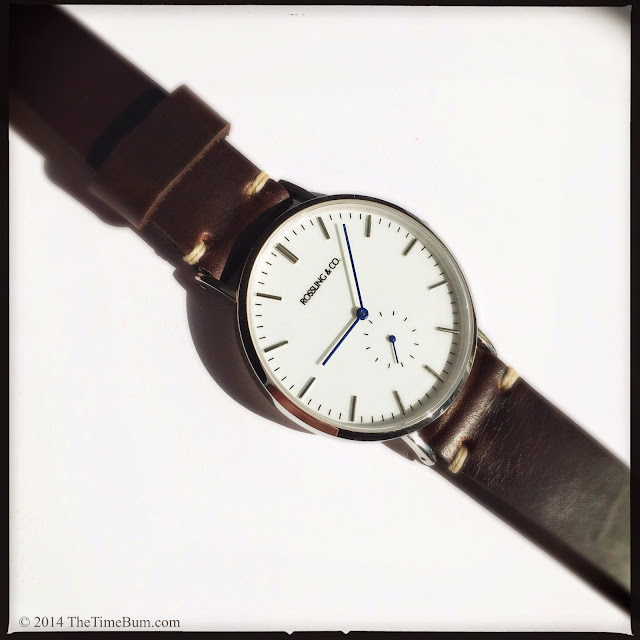 If you have been searching for slim, tapered, hand crafted strap at an excellent price, have a look at Vieux Halloo. * What can I say? Gratuitous rhyming makes me chuckle.